BIGCCS provides CO2 mixture property knowledge much needed for efficient and robust CCS. The 2 °C / 1.5 °C goals agreed on the UN Conference on Climate Change in Paris (COP21) are very positive but will require the development and deployment of a range of different technologies. COP21: The Paris Agreement, we got a deal! CO2 capture, transport, and storage (CCS) will be an important part of the solution to reduce the emissions in a cost-efficient way. More than six billion tonnes of CO2 will have to be transported from the CO2 sources to storage sites in 2050 according to the two-degrees scenario (2DS) of the International Energy Agency, requiring investments and transportation infrastructure on par with or larger than the current network for natural gas. Excess design margins will hence lead to huge additions in costs. To realize CCS in a cost efficient and reliable way, it is very important to precisely determine the properties of CO2. For instance, to save on energy and material costs, CO2 will usually be transported in liquid state. However, if the pressure of pure CO2 is decreased below a certain temperature dependent limit, the liquid will expand to a gas with a volume that is at least a factor 10 larger. Hence, it is of great interest to determine the pressure of liquefaction for different temperatures, which is called the boiling point pure CO2. However, the CO2 in CCS will not be pure, but contain contaminants depending on the CO2 source and capture technique employed. These contaminants can drastically alter the properties of CO2. Sometimes the impact of the impurities will make processes like for instance transport more difficult and expensive, but removing contaminants completely has a high cost as well. Unfortunately, an accurate quantification of the impact of many important impurities on important properties is lacking, which makes it impossible to find the optimum purification level within acceptable margins. Task 2.2 of the BIGCCS Centre, the CO2Mix project, supported by the CLIMIT and FME programmes of the Research Council of Norway, aim has been to close some of the knowledge gaps for a selection of properties, with SINTEF Energy Research and NTNU performing measurements of the liquid and vapor compositions as a function of pressure and temperature , and speed of sound and density measurements performed by Ruhr-Universität Bochum. With regards to the vapor-liquid phase behavior measurements, the effect of the important impurities nitrogen, oxygen, and argon has been investigated. A completely new facility, shown below, has been design and constructed by SINTEF Energy Research, with high accuracy in temperature (< 10 mK), pressure (0.03 %), and composition (0.03 %). The results for nitrogen, which recently has been published with a detailed description of the setup in the reference journal Fluid Phase Equilbria, are shown in the figure below. This article will also be available at a public repository. The figure includes two so called phase diagrams at two different temperatures, which show the phase behavior as a function of pressure and composition. 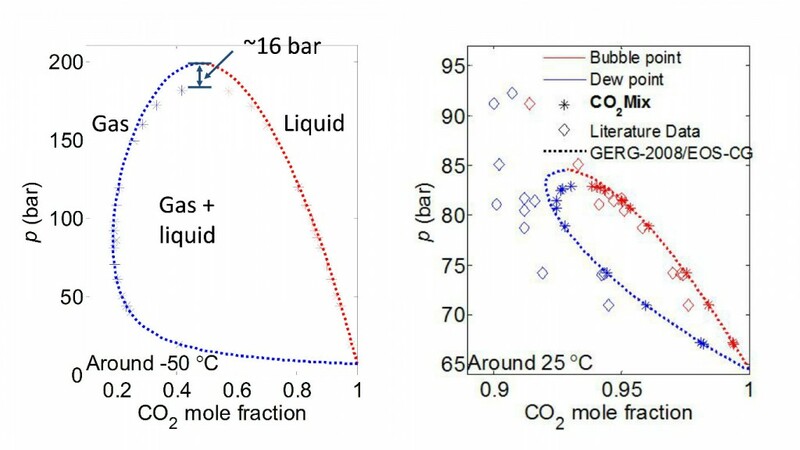 Unlike pure CO2, and depending on composition, there is a rather large region where the mixture between CO2 and nitrogen will consist of both gas and liquid, and the pressure where only high density liquid exist has increased significantly. Nitrogen is actually one of the impurities in CO2 where most phase behavior measurements have been published, but still neither the best available model nor previous data necessarily have the required accuracy needed for a robust design of CCS equipment. The situation is much worse with oxygen, shown in the figure below, where there were only a very few and mostly more than 40 years old measurements prior to CO2Mix. These data has been submitted to Fluid Phase Equilibria as well. For other impurities the data situation is mostly worse. CO2Mix phase equilibrium measurements of CO2-O2. Left: Around 0 °C, right: 6 measured isotherms. An important feature of the CO2Mix facility for vapor-liquid phase behavior measurements is the ability to view the fluids under test even at high pressure and temperatures far from ambient using a camera. Hence, it is for instance possible to identify the so called composition critical point, located just below the green markers (in the figure above), above which single phase behavior is guaranteed regardless of impurity concentration. It is also possible to some degree to identify solid phase formation, which is utilized in the most recent measurements on CO2-Ar. 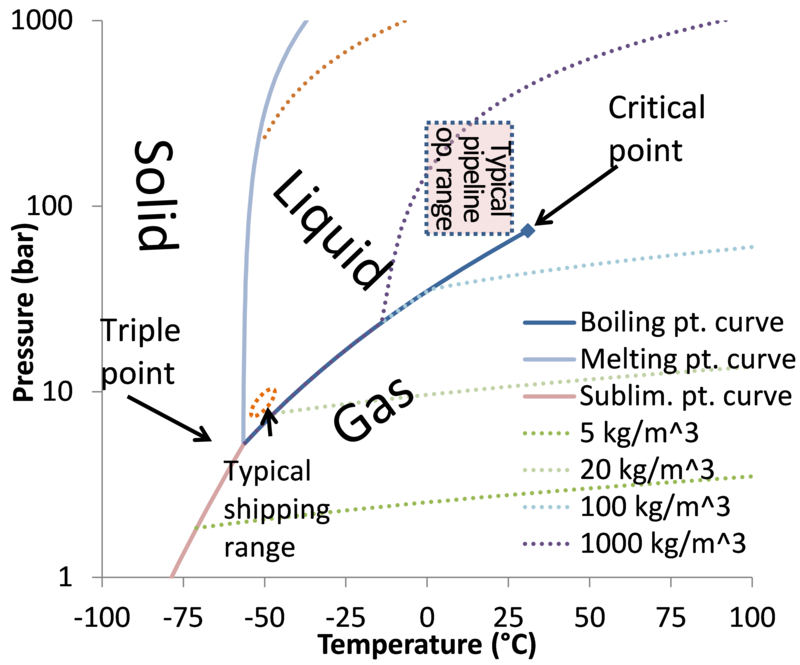 Solid phase formation could occur during intentional or unintentional rapid pressure drop, where temperature could decrease significantly, but is also important to quantify in order to improve low temperature separation processes. The phase behavior data of CO2-Ar including solid phase information studies are currently under processing. SINTEF Energy Research and its international partners are aiming to close remaining knowledge gaps on CO2 mixture properties. Despite the efforts by the CO2Mix projects, there are still a need for better data on a range of different properties and CO2-rich mixtures relevant for CCS. SINTEF Energy Research and its international partners are aiming to close remaining knowledge gaps on CO2 mixture properties. The CO2Mix project is in its final year in 2015. The international network and activities generated by the project was a contributing factor to establish the EU project IMPACTS, which has co-funded the phase equilibrium measurements in 2015. 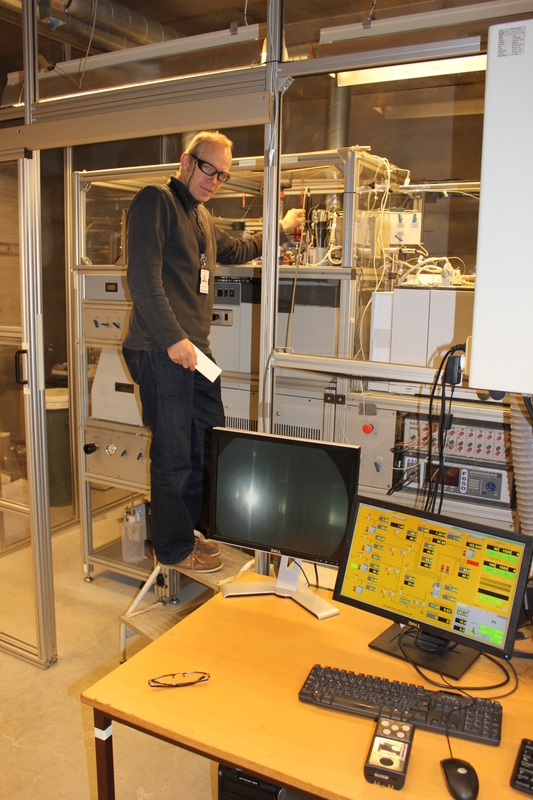 There will in 2016 be phase equilibrium measurement using the CO2Mix setup in the Norway grant project CCSPhase. In addition to phase behaviour, SINTEF Energy Research aim to address other properties such as viscosity and density in the years ahead. As part of the European CO2 Capture and Storage Laboratory Infrastructure (ECCSEL) SINTEF Energy Research has received infrastructure funding from the Research Council of Norway and are currently constructing new advanced facilities to obtain more of the properties needed to enable safe, efficient and robust CCS systems. N2-CO2 systems can easily be modelled with a simple SRK cubic model, with one fitted binary interaction parameter! There is no magic there! For the more advanced mixtures we can also use good predictive SAFT models (as those developed in FME SUCCESS by Miri et al.). Firstly, I would like to thank you for showing interest in our blog. 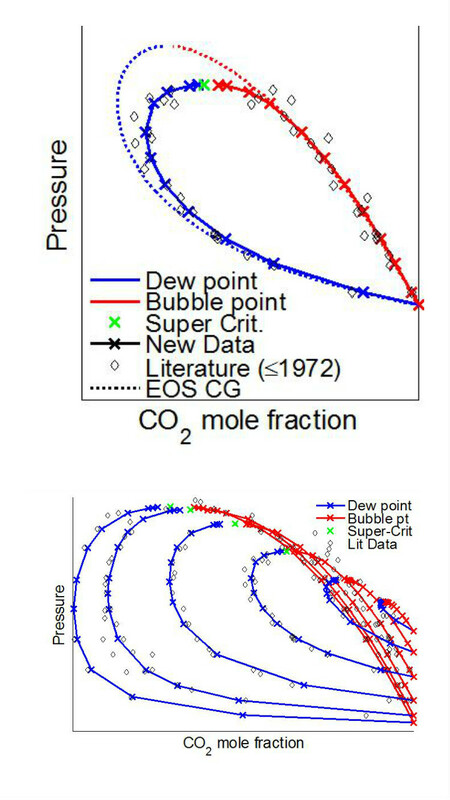 We have fitted our data to ordinary cubic equation of states such as SRK (with both Huron-Vidal and van der Waal mixing rules), and PR (with van der Waal), but these model did such a poor job in replicating the VLE behavior of CO2-N2 that we did not even include these results in our publications (eg http://dx.doi.org/10.1016/j.fluid.2015.09.034 ). Even if we optimize for just a single temperature, there were large errors at the dew point side and in the critical region. For the critical point we are here talking about deviations of several bar at high temperatures, and as much as 20 bar at -50 C. Such deviations are unacceptable, and very costly, if you want to design a process or eg. a pipeline. What we have also found is that the optimal fitting parameter (binary interaction coefficient) of these equations depends on temperature, and hence using just one parameter for all temperatures will increase inaccuracies further. The most accurate model currently around for CCS transport is in our opinion probably the EOS-CG ( http://dx.doi.org/10.1016/j.jct.2015.05.015 ) which is an adaption to humid and combustion gases of the well known GERG equation for natural gas. Current work is underway to add more components to EOS-CG. This is however a rather complex equation of state, and hence we have also applied a specialized version of Peng-Robinson, with the rather long acronym PR-MC-WS-NRT*. These two models were fitted to VLE data on CO2-N2, an exercise we later have repeated also for CO2-O2 (to be published). In both cases we achieved a reasonable accurate fit. It should however be noted that no model so far handles the critical regions perfectly, so there is still room for making models with even better formulations.